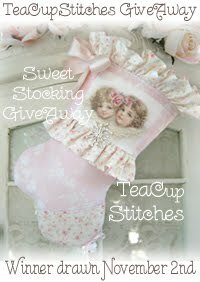 **~ A POCKET FULL OF ROSES~**: YET ANOTHER BEAUTIFUL TEACUPSTITCHES GIVEAWAY! CLICK THE IMAGE BELOW AND BE REDIRECTED TO ENTER A CHANCE TO WIN LYNN BEAUTIFUL GIVEAWAY!! ALSO PLEASE SCROLL DOWN TO THE LAST POST FOR MY VERY FIRST GIVEAWAY!!! HER STUFF IS BRILLIANTLY PRETTY! I WILL POP BY...BUT FIRST...I HEAR YOU'RE HOSTING YOUR FIRST GIVEAWAY...SO GUESS WHERE I'M HEADED? I hope all is well with you.. Thank you so much for your most welcome visit and kind words. I just love this lovely stocking... It is sweet indeed! Good Sunday Morning my friend. Love Lynn's pretties and her giveaways are fabulous. I will travel there next. I am also keeping my fingers crossed in your fab giveaway.